After setting all the clocks ahead last night, we found out that Arizona stays on standard time all year. Tomorrow we'll be in New Mexico so the clocks will be right again. We walked to the nearby Tlaquepaque (ta-lockey-pockey) upscale area of art shops and restaurants. After lunch I hiked up Schnebly Hill Road to the the Munds Mountain Wilderness. 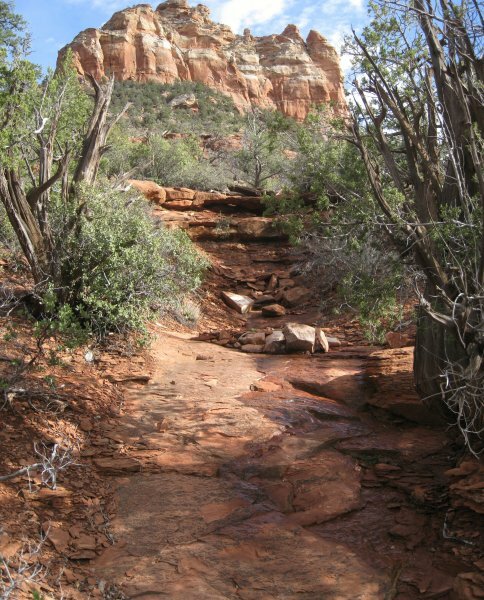 The trail encircles Sedona. The views of the various mountains are spectacular (see photo).